“Voted #1 beach in America” popular Siesta Key Beach, Siesta key Florida, The Magnolia House offers the perfect vacation getaway. There are 2 units; One Downstairs “317” and one upstairs “379”. A short walk to the Siesta Key Village or the Siesta Key Beach. Recently renovated kitchens, The Magnolia House maintains that great 'Old Florida' flair with all of the modern day amenities our guests expect. Once you arrive, simply park the car and let the good life begin... Walk one block to Siesta Key Village for a fresh tropical drink at the Daiquiri Deck, or have some oysters at the Siesta Key Oyster Bar. Ready for the beach? The Siesta Key Beach meets the Gulf of Mexico only steps away! Need some groceries or some new flip flops? You guessed it... nearby! Don't feel like going anywhere? How about a dip in your own heated pool? Guests at The Magnolia House have it all! 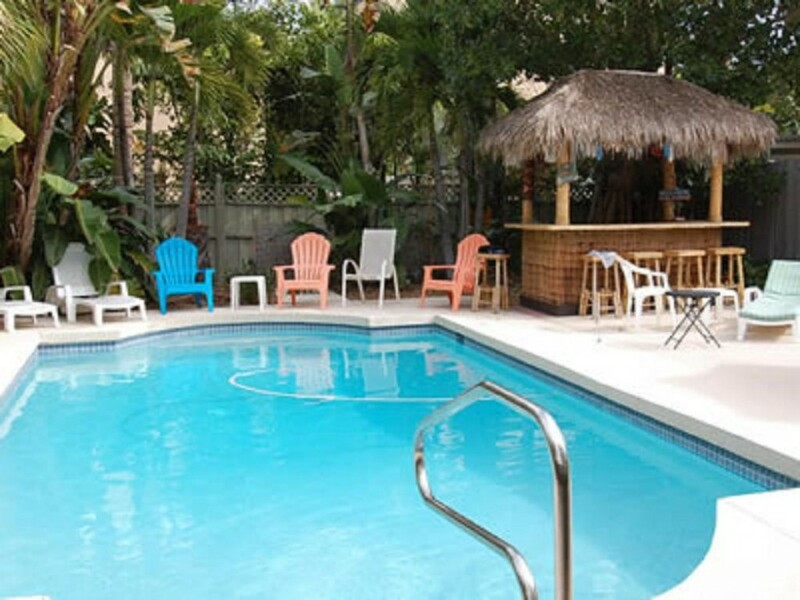 Cherished Siesta Key beach memories have been made at The Magnolia House for over twenty years. We hope you'll join us to create your own! PLEASE CALL 941-356-0651 FOR AVAILABILITY AND SPECIAL RATES! Enjoy your own tiki hut out by the pool with covered grill to cook out. Plenty of loungers and table and chairs to relax and dine by the pool. Check in is 4 pm, and check out is 9:30 am. Maximum guests 6. Book from Saturday to Saturday. 1 week minimum. 1 covered and 1 open parking space. In house laundry room. Outside pool/beach storage closet. Please take your trash out before departing and put your dirty laundry in baskets provided in laundry room, and start your sheets in washer before leaving. Please call Banyan Tree Beach resort LLC @941-346-0651 for all questions and concern. Great for couples, families and larger groups to up 12 for family get together.